GREEN BAY — James Jones is heading home, but not to play for the Raiders, as he did last year. He’s going back to San Jose with the team that originally drafted him out of San Jose. “Just watching the tape of James at Oakland, and more so his time in New York during the preseason, he looked very similar to his time in Green Bay. I thought he would flow right into the offense, as he did in the past,” Packers Head Coach Mike McCarthy said of the Packers wide receiver, who was released twice before signing with the team that drafted him and with whom he enjoyed the best years of his career. Life is good, again, for Jones, who has four touchdown catches through the first three weeks of the season. Jones needed the Packers as much as the Packers needed Jones. The Packers’ need is the result of injuries at the wide receiver position, beginning with the loss of Jordy Nelson for the season. Since then, Nelson’s replacement, Davante Adams, has fallen to an ankle injury that has cost him time and sounds as though it will cause him to miss Sunday’s game against the 49ers. 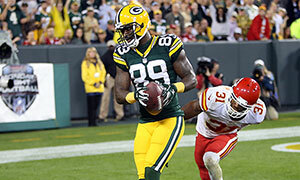 “He’s going to have to jump through some hoops tomorrow,” McCarthy said on Friday.